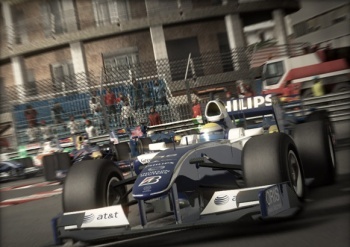 Codemasters CEO Calls Pre-Owned Sales Model "Destructive"
Codemasters CEO Rod Cousens says retailers and game publishers need to work together to figure out a way to bring the "ridiculous" confrontations over pre-owned game sales to a happy ending for everyone. We've heard it all before. Retailers need the fat profit margins of pre-owned game sales but publishers feel cheated because they only see revenue from sales of brand new copies. Retail has been the big winner so far but publishers are doing what they can to turn things around with programs like EA's "Project Ten Dollar" and post-launch DLC releases that effectively shut the door on used game buyers. Cousens says both sides in the debate have valid points and that some kind of accommodation has to be reached to end the "destructive" system that's currently in place. DLC could feature prominently in any compromise solution, he said, suggesting that Codemasters could release a six-track retail version of its Formula 1 racing game and then add tracks via DLC as the season progresses, a system which would also give the game a more realistic, up-to-the-minute feel. "When you turn up in Abu Dhabi you have to pay for the circuit, and whatever the changes are to the cars that are put through," he told GamesIndustry. "That, I think, would deal with a lot of it, and also address the pre-owned." He said the confrontational attitudes shown by both retailers and publishers is "ridiculous" and could eventually have a negative impact on the games themselves. "The way it's structured today is destructive, and it's negative to creativity and innovation. I believe it has to be managed - there's an element of it which is acceptable, and there's an element that isn't," he explained. "If the content creators could participate in the secondary or subsequent exploitation, I think that's fair game. I think equally the retailer then has an argument that he should participate in some of the DLC, which they ordinarily wouldn't. By default, you manage the process." His points are valid but convincing either side of the need to compromise will be a tough sell. Tightly-integrated DLC will likely play a part, but the devil is in the details. EA is playing with single-use codes for bonus material, while EA Sports is using them for access to more fundamental aspects of gameplay like online access. Activision CEO Bobby Kotick has espoused a more conventional approach to DLC, which he expects will encourage gamers to stay committed to their purchases for longer stretches. THQ has even floated the idea of making gamers pay in advance for DLC that hasn't even been made. Gamers, meanwhile, just want to pay as little as possible for most of what they play and given the quality of a lot of games that hit the market these days, who can blame them? Ridiculous and destructive it may be, but it's most definitely not a problem that's going to be sorted out quickly, if it ever gets sorted out at all.